Measuring a pulse rate is an important skill for first aiders and first responders to acquire. When we feel the patients pulse at the wrist, we are feeling the pressure generated in the artery by the contraction and relaxation of the heart. As the heart contracts, pressure in the artery increases and we feel a ‘pulse’; as the heart relaxes, pressure falls and we feel nothing. The combined forces of contraction and relaxation generate the pulse. The heart contracts and relaxes (beats) at a rhythmic rate somewhere between 60 and 100 for most individuals. Heart rate can be increased by many factors including recent exercise, stress, hormones, temperature and infection. Heart rate may be decreased during sleep, by drugs, hypoxia (low levels of oxygen) and other factors. In the heart is a specific area known as the sino-atrial node that generates electrical impulses. These impulses are transmitted through the heart as electrical waves that pass along nerve fibres. As the electrical wave passes through the heart, the heart muscle contracts and pushes blood from the atria (top chambers) to the ventricles (bottom chambers). When taking the pulse it important to undertake the procedure correctly or an incorrect heart rate may be recorded. The pulse should be taken when the patient is sitting down and relaxed. The patient should not have just undertaken exercise or physical activity such as walking. The patient should not be stressed, as this will increase heart rate. The act of taking the pulse can cause the patient stress and clear explanation is required prior to the procedure. The wrist is the most common location to measure the pulse rate. Place the patients arm in a supported position at heart height if possible. 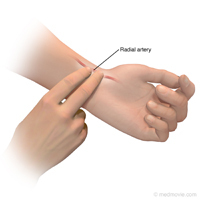 Use the second finger of your dominant hand to feel for a pulse at the radial artery just below the thumb (as shown in the picture).